What a fun weekend! We hosted a small baby shower yesterday. It was an "Apple of Their Eye" shower, so there were apples everywhere. 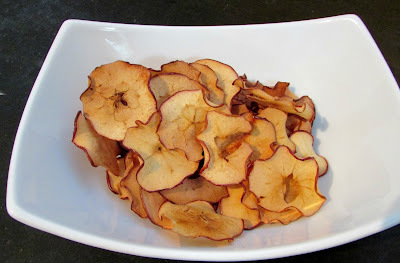 These apple chips will be needed for a few recipes that will be coming soon. You can also make them to go on your salads (with some pecans and bleu cheese... yum! ), or just for snacking. Just go ahead and make some, you will be glad you did! 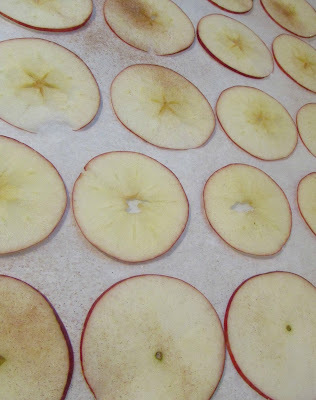 Preheat oven to 225 F and place a sheet of parchment paper on a baking sheet. Slice apples 1/4" thick. This is done easiest on a mandolin. Place in a single layer on the baking sheet. Sprinkle with cinnamon sugar. Bake for 45-60 minutes or until the edges start to curl. Turn off oven, but leave the door shut and let them sit for another 15 minutes or so. I have made three or four batches already this fall! I have been putting them in everything!